Just before his final shed. He spent a week or more sitting on top of their orange peel house. I dipped water on him now and then to help in case he was trying to shed. And he did molt out with a mangled wing. He is now sporting Salsa nail polish for ID though the mangled wing could help too. He seemed to have lost most of the paint this first time so must have rubbed it against something before dry so he got a second coat and in a bare container till dry. Now it's lopsided. Once dry I gave him the choice between his small container and the big colony tank. I moved my hand from one to the other till he decided to get off in the tank. Good luck buddy it's a roach metropolis, but I did just clear out most of the adult males and freeze them and some medium large to shrink the size a bit, for awhile. 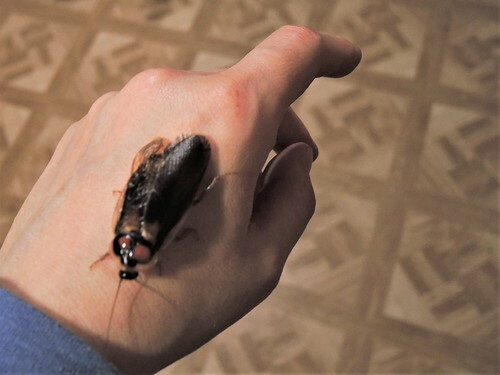 For those who didn't look at the other thread: This roach survived being frozen, served up to an anteater, and then going through a load in the washing machine. I figured after all of that it deserved to live so set him aside to mature. Since he turned out to be a male I named him Poseiden due to his watery adventure. I feed off most of the males but he will get to live till old age with all the ladies. Love it! I think Poseidon is a perfect name for him. The mangled wing gives him a rugged look, lol. Bet the lady roaches love that. That is fantastic. I pet mine gently, but I'd scream like a frigging schoolgirl if one crawled on me. Thank you. He is calmer than most males so that's good. I get them crawling on my hands all the time when I sort through them for feeding. Their spikey legs do feel weird. I did freak out a bit when Ikigai threw one on my face one night but mainly because in my sleepy state I thought it was a big spider. He leaves the colony alone now that I added a top to it though so that shouldn't happen again. That's awesome. I love roaches and have kept some before, including a wild American roach I caught in the house that had really weird looking mangled wings. 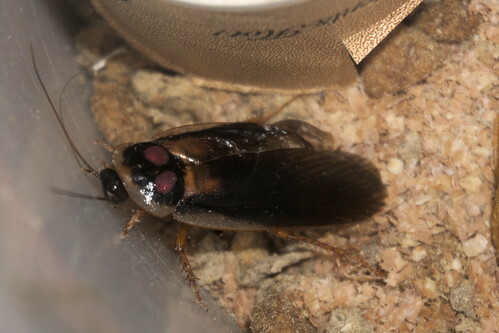 Normally any I catch in the house I release outside but I'd been seeing him for awhile, just popping up on my desk occasionally, and I never could catch him in my roach trap (a bucket with cat food) which works well most of the time, so once I finally caught him I decided to keep him since he looked so unusual and had been so elusive lol. What substrate do you use btw? It looks like oats maybe? I've used coco fiber but have had mite problems with that so was looking for an alternative. Sorry. For the late reply. The small group was in a container of dehydrated lamb dog food at first then moved them to a bigger container and added wheat bran. The large colony is in a dirt tank. So far no issues. Saw Poseidon the other night he is still sporting his paint and seems to be well. Some of the males have tattered papery wings, there are a few others with some kinda wrinkled wings like Poseidon as well. Maybe a genetic things. I had one female with no shoulder guards, at first I though she was a male with her wings ripped off but she was the only one. He's actually pretty cute! I don't really like roaches, but he's not creepy looking. Thank you. The paint probably helps. The males were all going crazy in the tank last night and I saw him. He did wear or scrape off most of one of his spots but the other is still obvious. If I do manage to get a hold of him sometime he'll need a touch up. Unfortunately Poseidon died :( I found his painted head plate. 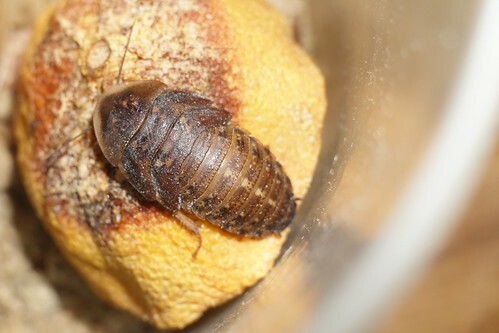 I'm wondering if I need to restart the tank with new soil to get rid of the dermestid beetles. I started seeing some dead roaches after they got introduced.